I recently purchased a Magellan Meridian Color GPS and have to say I’ve very impressed with this device. I bought it on e-bay as a buy it now purchase for GBP 250. Pretty pricy, but money well spent I thought. Although, it’s a bit chunky, it’s perfect for the type of conditions I want it for i.e. mountaineering, walking and climbing. Only downside at the moment is it seems to chew battery power. You’ll also find a comprehensive PC Magazine review here. 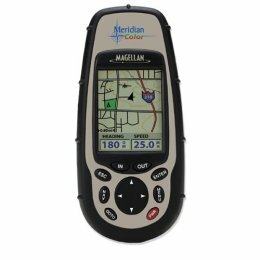 Magellan Meridian Color is the ultimate, top-of-the-line, GPS receiver and the first handheld to present all your positioning and navigational information in Full Color! The clear choice for the serious navigator, Meridian Color offers superior tracking and 3-meter accuracy, with an extensive, 16 MB, built-in mapping database that provides an easy way to view your location, heading and route on a large, high contrast, high color 120 x 160 pixel display. In attractive Champagne metallic, Meridian Color is rugged enough to go with you on any adventure, or just across town, designed to make getting where you’re going a fun, easy and safe trip. See where you are and where you’re going in vivid color on the industry’s first full-color 120 x 160 pixel display. Color enables you to easily see your location and route, differentiating between roads, interstates, parks, waterways, airports and other points of interest. Meridian Color finds your location by tracking up to 12 GPS satellites simultaneously. Assisted by the U.S. Wide Area Augmentation System (WAAS), the Meridian Color is accurate to within 3 meters or better. Start navigating right away with the extensive, 16 MB, built-in mapping database of North America, including highways, major roads, parks, waterways, airports, cities and marine navigation aids, such as buoys, obstructions, wrecks, lighthouses and more. Increase your mapping detail by downloading street-level maps on an optional Magellan SD memory card. Nine customizable graphic navigation displays show a map, compass, speedometer, and text readouts of heading, bearing, speed, direction, ETA, and more. Choose from 12 built-in coordinate systems and 76 datums including Latitude/Longitude, Universal Transverse Mercator, and Military Grid Reference System. Store up to 20 routes, 500 waypoints and 2,000 track-points to easily find your way back again. Save Track-to-Route The unique, Save Track-to-Route feature allows you to convert complicated track files into easy to follow routes. Save hundreds of routes by transferring them to a PC with Magellan MapSend software. NorthFinderTM NorthFinder technology shows your direction even when standing still. Sun/Moon positions Meridian Color shows you when the sun will rise and set, as well as the phase of the moon, for any date and location in the world. Fish and game calculator Want to know when the fish are likely to be biting in your little corner of the world? The Magellan Meridian Color can tell you. Satellite status Monitor the GPS satellites in view and get information about their status. Easily view all the GPS information you need in full color to make your adventure fun and safe, even at night. 2 AA batteries provide up to 13 hours of continuous use. Rubber armored, impact resistant plastic allows you to confidently take Meridian Color on that next great adventure. Meridian Color is sealed to IEC-529 IPX7 specifications – and it floats! The Meridian Color is intuitive, easy to use, and all the major functions are described in step-by-step instructions. If you speak English, French, German, Swedish, Finnish, Spanish, Italian, Portuguese or Dutch, so does the Magellan Meridian Color.